← Guest Post: ‘Home, Home Home, and the Telling of Stories,’ by Anthony Joseph Black. The end-of-terrace house is being done up. There is a high ladder up against the flat expanse of the gable end, and at the top of it a builder in a high-vis jacket is putting on the final layer of cream exterior paint. The job is nearly finished. At the bottom of the ladder his companion, foot on the bottom rung for safety, gives me the once-over as I pass by. This wall has history. It’s been a site of loyalist murals for years. During the 2002 soccer World Cup it sported a mural of the Spanish flag with the words “Viva Espana” roughly painted on it; the message was for supporters of the Irish Republic’s team, who had drawn Spain in their last 16 match. Flying from the drunkenly-leaning telegraph pole beside the mural was the flag of Gibraltar. The flags of Ireland’s other opponents were also painted on surrounding walls; that of Saudi Arabia on the wall of the Kimberley Inn cheerfully accompanied the Star of David, which was also fluttering from the telegraph pole. The Israeli flag had been flown in response to Palestinian solidarity being expressed on the Lower Ormeau Road. The corner was colourful, like a mini-UN. The Kimberley Inn has since been demolished, and apartments now stand in its place. In its day it was frequented by leading loyalist paramilitaries Raymond Elder and Joe Bratty, until they were killed by the IRA on the Ormeau Road in 1994. The outside wall of the bar used to sport a memorial to the two men. In 2003 UDA man Roy Green was shot dead outside the bar during the UDA’s internal feud. Any visitor unaware of the history of this particular corner would be forgiven for wondering why there is a fragment of wooden scrollwork on the gable wall with the word ‘Fighters’ on it; they wouldn’t know that it’s all that remains of the plaque of a red fist celebrating the Ormeau Road Freedom Fighters. The builders have painted neatly around it. This entry was posted in Uncategorized and tagged 2002 World Cup, Belfast, Football, Gibraltar, IRA, Israel, Joe Bratty, Kimberley Inn, Kimberley Street, Ormeau Road, Palestine, Raymond Elder, Republic of Ireland, Roy Green, Saudi Arabia, Soccer, Spain, UDA, UFF. Bookmark the permalink. 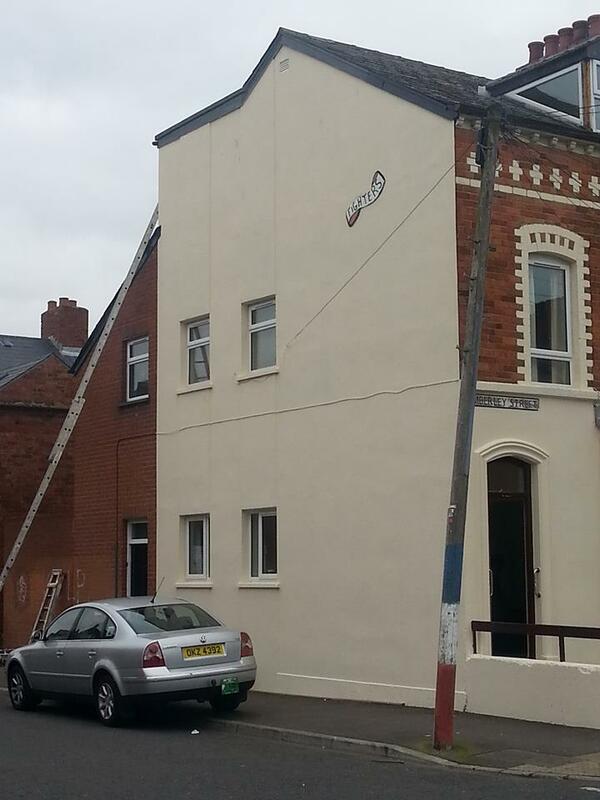 The builders have painted neatly around it…. just in case there is a chance that we might become a semi-normal society looking to the future instead of the past. Wouldn’t want that! Update: They’ve taken it down! Wow, I am quite surprised. However, the fact that it looked absolutely ludicrous may have had something to do with that. Unless you mean they’ve taken down the ladder!!! “Not my job” is another very nice piece of observation, Jason – nicely observed, nicely written. Think he was a left-footer Peter 😉 Thanks for your feedback. It seems to me he was actually a “right-footer” (i.e., of Loyalist / Protestant persuasion), since the term that normally applies to Roman Catholics / Fenians / Taigs is “wrong-footer” or “left-footer”, depending on how you look at it, since opinion seems to be divided as to whether, in this context, “right” means “correct” and so its opposite is “wrong” (rather than “left”). For clarification – or maybe further confusion?! – scan the Web with keywords such as Ulster spade, right-footer and wrong-footer. It’s no wonder there’s confusion, especially when it comes to “voting with your feet”, because, in order to do so (i.e., vote with your feet), you have to be able to tell not only right from wrong and right from left, but also left from wrong! Do you follow me?! Left, right, left, right!